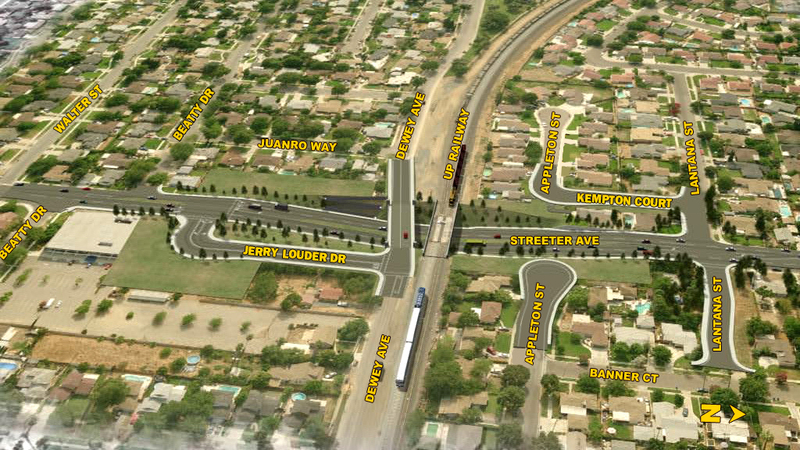 Streeter Avenue Grade Separation Continues - High-Light Electric Inc.
HLE is working for the City of Riverside to lower Streeter Avenue under a set of railroad tracks. A bridge will be built to carry Dewey Avenue over Streeter Avenue and another will be built to carry the railroad tracks over Streeter Avenue. Appleton and Lantana Streets will be realigned and a new street will be built to connect Streeter and Dewey Avenues. Upon completion, the project will eliminate 3-6 minutes delay for each emergency vehicle that has to stop for a train and traffic is expected to increase from 12,800 vehicles per day to 29,000. The project is expected to be completed by February 2015. Visit the City of Riverside website to find out more information and updates about the project.